Contains 70% organic content. No parabens, harsh preservatives, synthetic colors or fragrances, phthalates, sodium lauryl or laureth sulfate. NSF - contains organic ingredients. No animal testing. 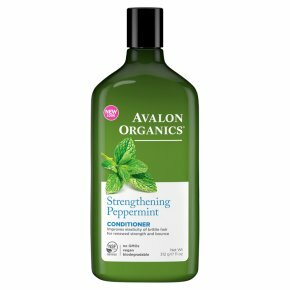 100% vegetarian ingredients.Peppermint Essential Oil, Babassu Oil, Aloe and Vitamins strengthen elasticity of weak, brittle hair while smoothing split ends and fly-aways for radiantly renewed bounce and length. Rich plant emollients plus revitalizing Babassu Oil, Vitamin E, Arginine and Peppermint condition hair while repairing elasticity to help prevent future breakage for stronger, smoother, healthier-looking hair. Caution: For external use only. Avoid contact with eyes.�Keep out of reach of children.